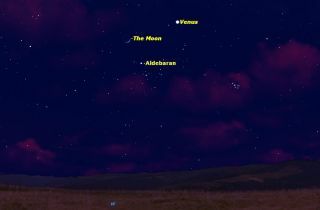 Venus and the crescent moon will be a dazzling sight in the western sky, weather permitting, about one hour after sunset on April 21, 2015 as seen in this sky map. If your local weather is clear tonight (April 21), you're in for a celestial treat. Turn to face west about 45 minutes after sunset, during mid-twilight, and you should see a beautiful crescent moon and floating well off to its right is the dazzling evening star: the planet Venus. Interestingly, many astronomy books state flatly that you can't see Venus in the middle of the night. But thanks to Daylight Time, those places close to the western flank of a particular time zone will indeed be able to see Venus at the "witching hour." From Pittsburgh, Venus won't set until 12:07 a.m., while from Terre Haute, Indiana — near the boundary line between Eastern and Central time — Venus won't set until 12:33 a.m.! Editor's Note: If you snap an amazing photo of Venus and the moon tonight and want to share it with Space.com for a story or gallery, send comments and images in to managing editor Tariq Malik at: spacephotos@space.com.